Television cameras were right on hand to catch the ‘awkward moment’ Angelina Jolie totally blanked Jennifer Aniston at the Golden Globes. Now, we all know Jennifer was married to fellow actor Brad Pitt, then they split and he started dating Angelina after filming the movie Mr and Mrs Smith together – but surely enough time has passed? Angelina is no longer with Brad and following their 12-year relationship, it looks as though there’s still some kind of atmosphere between her and Jen. As cameras panned across the audience in front of Jen and Carol Burnett as they presented an award together on Sunday night, we saw Angelina looking down at the table instead of at the stage. Yet at the same time, we see Fifty Shades star, Dakota Johnson, taking a sneaky glace over at Angelina. Look at the intense side-eye action! You’re lying if you can’t relate to Dakota staring at Angelina’s face for a reaction to Jennifer being on stage. Dakota Johnson got caught watching Angelina Jolie while Jennifer Aniston presented: When you’re trying to be subtle, but you can’t help yourself. While presenting, the audience gave a standing ovation for Golden Globes award winner Carol Burnett, who was on stage with Jennifer. 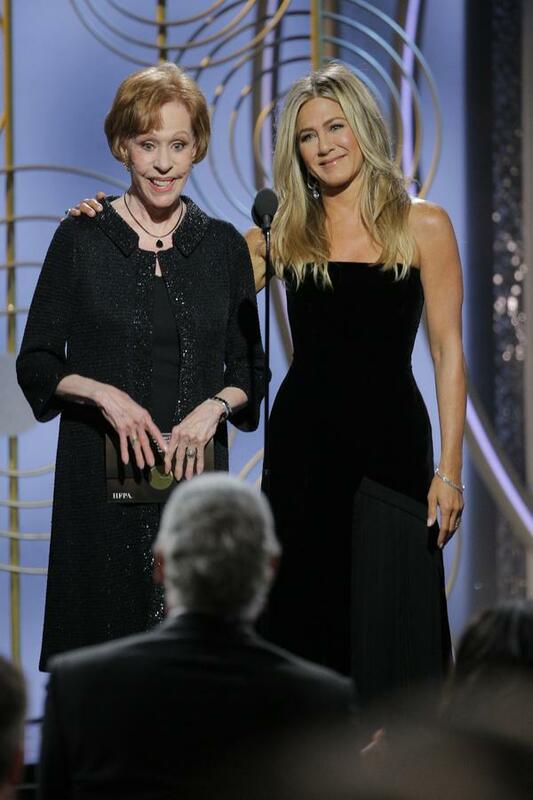 I love that they gave Carol Burnett a standing ovation so that Angelina Jolie had to give one too which means she basically had to give one to Jennifer Aniston. I’m just petty like that. Lol at Angelina Jolie participating in a standing ovation that’s half for Jennifer Aniston. Both Jen and Angelina presented awards, with Aniston handing out the award for Best Performance by an Actress in a Television Series – Musical or Comedy and Jolie joined French actress Isabelle Huppert to present the award for best actress in a motion picture, drama. One thing people just couldn’t cope with, was how good Jennifer was looking. Does she not age? Love when Jennifer Aniston reminds us all she’s an ageless vampire. My word. was this in 2008 or 2018? Damn just saw Jennifer Aniston in the background at the golden globes, girl, idk what kinda dark magic u using but i swear on my life you ain't a day over 20. start a family with me. According to Mail Online, Jen and Angelina both attended the Netflix after-party but were ‘not photographed together or spotted running into each other’. I’m sure there’s no animosity between the pair now, enough time has passed?